Today’s meeting at Colac was a little different from the norm. I invited the Colac City Band to come and provide music. I might talk about that another time—suffice it to say, we had a great time. I didn’t intentionally pick a theme, but most of the music I chose seemed to refer to God’s creation and how it points to his glory. I followed this theme in my sermon. I showed a picture of the earth which was taken by the Voyager 1 space craft in 1990, when it was about four billion miles away. The earth is that pale blue dot. I’ve circled it so you can see it. A trick of the light (the sun was just out of the shot) meant that it looks like the earth is in the middle of a sunbeam. 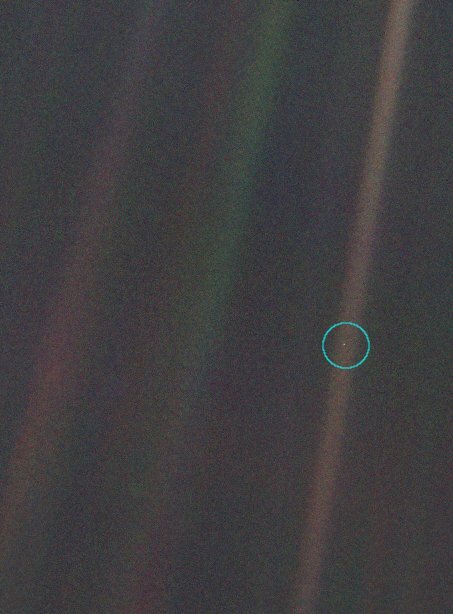 We succeeded in taking that picture [from deep space], and, if you look at it, you see a dot. That’s here. That’s home. That’s us. On it, everyone you ever heard of, every human being who ever lived, lived out their lives. The aggregate of all our joys and sufferings, thousands of confident religions, ideologies and economic doctrines, every hunter and forager, every hero and coward, every creator and destroyer of civilizations, every king and peasant, every young couple in love, every hopeful child, every mother and father, every inventor and explorer, every teacher of morals, every corrupt politician, every superstar, every supreme leader, every saint and sinner in the history of our species, lived there on a mote of dust, suspended in a sunbeam. If you look carefully, you might see yourself. What were you doing on February 14, 1990? When I see this photo, I think about how big the universe is. Or, how small we are. Of course, this is just a matter of scale. If you were to stand next to a rock 8000 meters tall, you’d be forgiven for thinking nothing could be larger. Yet that rock stands on an even larger continent… which is just a small part of that pale blue dot, which is nothing compared to the sun it orbits, which itself is but a speck in a not so big galaxy. On the other hand, next time a mosquito bites you have a look before you kill it. It’s tiny. It’s hard to imagine how things could be much smaller. But again, in it’s proboscis live parasites (which hopefully aren’t dangerous!). On those parasites live bacteria, which might host virii, which contain DNA, which are composed of genes, which are built with molecules, which are collections of atoms, which are made of all those sub-atomic particles New Scientist loves to write about. God is in those small things. If you were to keep shrinking and shrinking, or if you were to keep growing and growing you’d find God at every order of magnitude. To put it simply, God doesn’t care about scale. That’s why a thousand years are as a day to God, and a day is as a thousand years. It’s why there are no big sins and small sins. It’s why God calls our foolishness wisdom and our wisdom foolishness. Like God, those things just are. It’s not that God has a different scale by which he measures. He simply transcends anything which we might think happens to be important. So when you look at that pale blue dot, remember that God knows it (and everything on it) intimately. We are measured by him—and when we are found wanting, he gives us the grace to grow according to the one scale he cares about. So is it reasonable to think that in a universe containing hundreds of billions of galaxies, with each of those galaxies containing hundreds of billions of stars, that there is a creator being who made all that yet cares about the human inhabitants of a speck of dust in that universe? Seems unlikely to me. Perhaps it’s more likely that those humans have a need to feel important, hence creating a god of their own making. If you take my initial premise—that God’s idea of scale is of a different sort to ours, it’s quite reasonable. And that premise is predicated on the existence of the particular God I’m talking about. If we don’t allow that idea then you’re quite right. The important thing I missed (in retrospect) is a discussion of whether or not there is life elsewhere in the universe, and what affect that would have on our views of ourselves, God, and our view of God’s view of us. So if scale is ‘meaningless’ to God, do you think that applies to time also? One of the main problems I have with traditional, mainstream Christianity is the concept of hell as a place of eternal punishment. In a nutshell, I believe infinite punishment for finite ‘sins’ is evil. But perhaps God has no problem with this because he does not have the same concept of time that we do, so eternal means the same as two minutes to Him. What do you think about this? Like you, I find the idea of an eternal conscious punishment immoral, and I don’t think God having a different sense of scale really rescues the idea, because we are punished according to our own sense of scale. So what do you make of the 11th doctrine? I’m not too sure about the first bit (about the immortality of the soul). I don’t see that as being biblical—in the Bible, we don’t ‘have’ a soul, we ‘are’ a soul. Any reference to the soul as a separate thing seems to be a poetic way of saying ‘me.’ So it seems nonsensical to say the soul lives on after we die. If that were the case, why would there be a resurrection of the body? I’m more or less fine with the rest of the doctrine, though. My view is that we are raised at the judgment. The righteous go to ‘eternal happiness’ while the ‘wicked’ go to ‘endless punishment.’ I think death counts as an eternal punishment. Our legal systems seem to agree. Having said all of that, these questions aren’t central to my faith. I work on the principal that there are two options after death. I’d prefer the good one. Also, Christianity is far more to do with our lives on earth than it is what happens afterwards. I think the real test of a person’s faith and character is whether or not they live Godly lives for reasons other than the prospect of eternal fire insurance. The end of consciousness at physical death seems to be a reasonable outcome for those that do not believe (if we assume that those that do believe go to heaven), as compared to the endless torment idea. I really like the comments in your last paragraph – I see too many people who are living for an afterlife above everything that is right here and now. I’m glad that there seem to be a few officers that are willing to think outside the fundamentalist box, however I am worried for the future when I read the opinions of training college leadership, cadets and candidates, who seem to be very much of the hellfire and damnation mindset. I think the best teaching Jesus made about the afterlife is in Matthew 25. Jesus seemed to think the afterlife is for those who do their best to end hell on earth for the unfortunate. I certainly am. Jesus or hell. Turn or burn. As Charles Dickens once said, it was the best of times, it was the worst of times. It’s been interesting in the last couple of years—we seemed to have done some funny things with regard to our theology, but we also seem to have recovered a lot of the passion we lost over the last fifty years. A lot of the change I’m seeing seems to be coming from the younger generation. If they can grow in wisdom without losing the passion I think the Army’s going to do some great things. I saw that post when it was posted, and I nearly commented as well. I didn’t, but for no good reason. My personal opinion is that anyone in any sort of authority must allow themselves to be questioned. That is an important principle in the democratic process, and with good reason. The Army isn’t a democracy, but if a leader sets themselves apart from the led, they are doomed. That’s something I really like about our current TC. I may disagree with a few of his decisions, but he doesn’t mind being challenged about them. He seems genuinely capable of hearing, tolerating and accepting dissent. My personal view is that blogging is a conversation. If I am going to say something, I want people to respond. Obviously I’d like them to agree, but I’d also like to know if people disagree. If people are going to disagree they might actually have a good reason, and discussing the reasons can lead to, you know, learning and mutual respect. I don’t know why that scares people. This is by far the longest conversation I’ve had since beginning this blog, and I don’t think it’s hurt anyone. I leave comments wide open on my blog, and I allow them to be published before I read them. I have a couple of simple rules (See my comment guidelines) and I won’t delete anything unless it’s obviously meant to offend, is illegal or not suitable for my kids to read.